Spiral Shaped Jali in Red Sandstone. 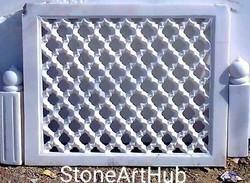 The quality and natural beauty of our sand stone jali manufacturer has made them widely popular among our clients. Available in a variety of shapes and styles, these provide solutions for all requirements of our clients and can be availed at industry leading prices. In order to cater to the numerous necessities of the patrons, we have been able to provide a wide range of Sandstone Jali.